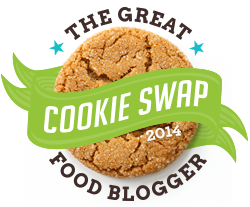 It is finally that time of year again, time for the annual food blogger cookie swap! This is my third year participating. It’s always a little challenging to think of a durable cookie recipe. I am a huge fan of mint chocolate, so when I saw this recipe come up I got excited! I find that mixing in melted chocolate to the base of the cookie makes for really wonderful, rich flavors in the cookie dough. In other news, I was called in last night to delivery a baby. It was my first time delivering a patient that I have known since her first prenatal visit. It was such a rewarding and amazing experience! A huge thanks to Krista at Destination Delish for her Chocolate Dipped Orange Spitz Cookies with Candied Orange Peel Sprinkles, Tanaya’s Table for her Bourbon Pecan Pie Cookies and Elana from Stir and Strain for her Rum Balls. In a medium bowl, beat together well the flour, baking powder, and salt and set aside. Melt the chocolate in the microwave on 50 percent power for 1 minute, stir, and microwave for 15 seconds more and stir; set aside. You can continue to microwave in 15 second intervals until all the chips are melted if needed. In a bowl using a hand mixer, beat together 2 1/2 cups of the sugar, the oil, butter and corn syrup to blend. Beat in the eggs, egg yolk, vanilla and peppermint extract. Then on low, beat in the melted chocolate. Add the flour mixture and beat in on low speed. Wrap the dough in plastic and refrigerate for several hours or overnight. Heat oven to 325 degrees F. Line baking sheet with parchment. Take out about one-quarter of the dough at a time to shape. Roll the dough into 1 inch balls. Pour the remaining 1/4 cup granulated sugar into one bowl and the confectioners’ sugar in another bowl. Roll each cookie dough ball lightly in granulated sugar first, then very heavily in confectioners’ sugar. Arrange cookies 2 inches apart on the foil. For crisp cookies, bake 11 to 12 minutes. 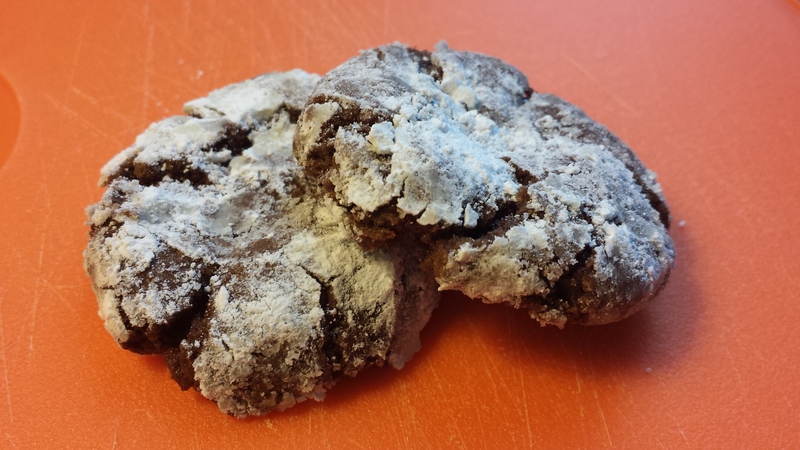 For a chewier cookie, bake 8 to 10 minutes. Bake one sheet at a time. Allow cookies to cool for 1-2 minutes, the press flat with a spatula.